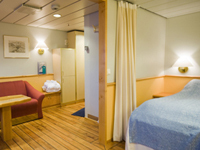 Departing from Kirkenes on January 1, 2020, prices starting at $1,222. MS Richard With is named after the founder of Hurtigruten, Captain Richard With. His establishment of the Norwegian Coastal Express back in 1893 had an enormous impact on life along the Norwegian coast. 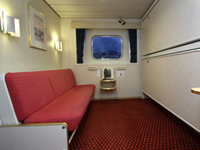 This ship was delivered to Hurtigruten in 1993, 100 years after the founder completed his first ever Hurtigruten voyage. 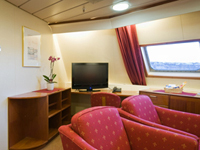 On board there is beautiful art by the famous Harr family, a number of Jacuzzis and eight well-appointed junior suites. After a day of exploring, the gorgeous panorama lounges, Horisont and Syvstjernen, treat you to unforgettable views of the surrounding scenery. Separate beds, one bed can be turned into a sofa. One or two rooms, seating area, TV, mini-bar, some with private balcony. Separate beds, one bed can be turned into a sofa, table. Separate beds, one bed can be turned into a sofa. 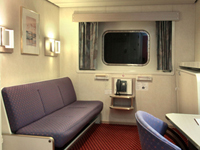 Some with upper/lower berths. With limited/no view, separate beds, one bed can be turned in to a sofa. 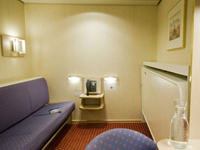 Some with upper/lower berths. 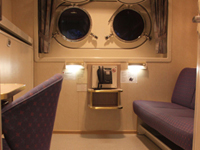 With portholes, separate beds, one bed can be turned into a sofa. Some with limited/no view. 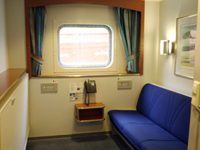 Separate beds, one bed can be turned into a sofa (some with upper/lower berths). Hurtigruten operates a fleet of custom-built, hybrid vessels combining the attributes of a small cruise ship with the daily duties of transportation for locals and freight. This combination creates a unique blend of travel experiences woven into the rhythms of daily Norwegian coastal life. All ships depart from Bergen, in the South, on a daily schedule and make the full roundtrip up to Kirkenes, in the North, and back again in 11-nights/12-days. Guests can book The Voyage North for 6-nights/7-days, The Voyage South for 5-nights/6-days, The Norwegian Discovery for 10-nights/11-days or The Roundtrip Voyage for 11-nights/12-days. While some stops to the 34 ports are short for loading and unloading vehicles, freight and locals, other visits allow for unique seasonal shore excursions and sightseeing for travelers. Norwegian chefs use locally-sourced and seasonal meats, fish, cheeses and produce supplied along the route. 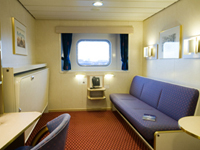 Guests may book accommodations ranging from Inside to Suite category cabins.